When you’ve got a cup of heavy cream left in the fridge, sometimes you’ve just got to make some pasta. For the longest time I thought making a cream sauce was hard work. It was this unattainable meal that I just didn’t know how to recreate. So I would buy it in a can for years, until one day I found the basics in an easy recipe: heavy cream, water (or chicken broth), egg yolk, and garlic. Cook it up and bam. Cream sauce. Who knew?? 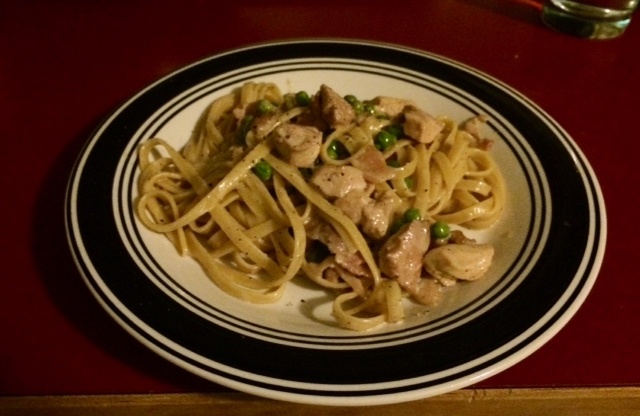 Add some spices to alter the taste and it can be anything you want, even chicken carbonara… which I think I’m going to try to put on a pizza soon…. But for now, it’s going in pasta. In a large saucepan cook minced garlic and diced bacon until bacon is crispy. Add chicken and cook until browned. In a bowl, mix water, heavy cream, and egg yolk. Add to sauce pan with frozen peas and black pepper. Cook for 10 minutes, or until sauce has started to thicken. Add pasta and parmesan cheese. Stir and cook until sauce is no longer runny and pasta has absorbed the sauce. Serve and enjoy.